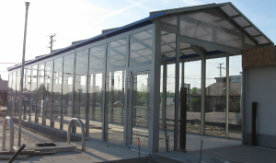 Glass car wash buildings are a great way to increase your car wash business’ curb appeal! The glass car wash is a timeless structure that attracts visitors to your car wash while providing you with a low maintenance building. When you build a car wash with glass, car wash buildings combined with great lighting, you get great street presence and get your car wash business noticed! 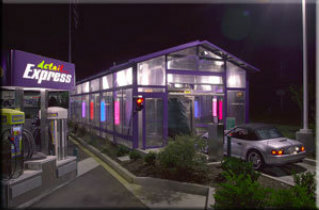 With lighting and glass, customers will see that your car wash is open, even at night. New Horizons can build car wash glass buildings with great turnaround time so you can begin making money quickly. Glass car wash buildings will help you create a business that is great for passive income. These clear glass structures are even mobile, so if you ever decide to move your car wash business, you won’t need to replace the car wash buildings. No matter what type of glass car wash structure you decide on when building your car wash business, the experts at New Horizons Car Wash will build car wash design guaranteed to last. Although our car wash buildings are made of glass, the structures we construct are built using only the highest standards in the car wash building industry. Our glass car wash systems are of the highest quality and extremely dependable. We build car wash buildings to last! As with all of our car wash structures, we always build our car wash glass buildings according to your car wash business needs. Choose the custom car wash size you require; we are happy to custom build your glass car wash building to your length and width specifications! When we build a car wash, we customize your glass car wash building to suit your individual needs. We offer 80 different colors for the aluminum structure and provide optional additions such as retractable roofs, equipment rooms and kneewall upgrades. We can also build a car washes with a retractable roof that will cut down on the steam and green house effect of the car wash and keep your building looking beautiful! 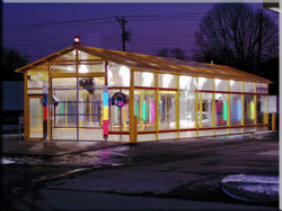 A glass car wash building provides great visibility for your entire operation! Whether on a sunny day or at night with ample lighting, our glass car wash buildings are sure to attract visitors instantly. Build car wash designs that are appealing and they will come! Would you like an equipment room for your car wash structure? How about a door for personnel? 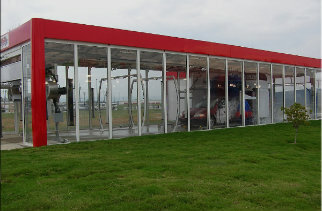 Are you interested in including self service car wash structures? New Horizons promises to listen to your business needs and we will build car wash designs accordingly. We also build automatic car washes buildings (touch-less washes), self service car wash buildings (hand washing), vacuum bays and offer kneewall upgrades for our glass car wash buildings. When it comes to building glass car washes, New Horizons car wash builders are the experts. If you are looking to be your own boss and run your own business then contact the New Horizons car wash experts today. Our team will help you find the structure and accessories that meets your needs so you can start your new car wash business as soon as possible.